In Part II of my Chaucer research I established that not all groupings, or fragments are stable across manuscripts, making them difficult to trace. While what is considered Fragment III is for the most part unchanging across versions of the text, Fragment IV and V are often found broken up and rearranged, insinuating that they were never received as a full group; their adherence to each other was based on what the scribes believed to be common sense. The most apparent discrepancies in ordering occur with the Clerk’s, Merchant’s, Squire’s, and Franklin’s Tales, with the most likely explanation being that the tales were not found in one sequence, but individually, leaving the scribes to draw inferences for the links. Yet there are several strands of scholarship that believe the links between these tales, along with the cues within the tales, were absolutely meant to create a coherence between them, and already in existence before the scribes had a chance to form any of their own opinions; it was only a matter of piecing the links and tales together. Further, it is believed (and I believe this as well), that the two fragments should never have been separated, but rather consolidated to reflect one of the most prominent sequences in the Canterbury Tales. As has been discussed, the Clerk’s Tale must follow the Wife’s, but with no distinct marker of where within the Tales this must happen. Since the Wife’s Tale is a part of Fragment III in the Ellesmere, the Clerk’s Tale is the first part of Fragment IV. In the Hengwrt, for reasons rather unknown, the Clerk’s Tale follows the Second Nun’s Tale, once again implying that the scribe was most likely at first copying all the tales in the order in which they were received, and only later editing for context. Several arguments have been made in favor of a repositioning of the Clerk’s Tale, but none propose convincing arguments for an alternate position. Furthermore, several manuscripts outside of Ellesmere place the Clerk’s Tale after the Summoner’s. Why? The Clerk’s Tale itself is highly problematic. The different parts are clearly numbered and outlined, but the ending, including the Envoy, on several occasions appears in different orders, and the Host Stanza is often times missing (Harley4, Lansdowne, and Petworth House Manuscripts). The rationale for this has to do with the prologue of the Merchant’s Tale that picks up on the “wepying and waylyng” echoed by the last part of the Clerk’s Tale, making the Host Stanza appear intrusive and out of place. And if the Host Stanza does not belong in between these two parts, it definitely does not belong anywhere else, and therefore it is omitted in a number of manuscripts. When Morse conducted a close analysis of the Ellesmere manuscript he found that the Host Stanza was written on a separate sheet, and perhaps added to the end of the Clerk’s Tale after the tale had already been copied without it. Once Morse mentions it, it becomes clear when looking at the manuscript, judging from the different colors of ink used. There is a very clear variation. In a more detailed report Parks looks at the variations of the aging process in different batches of ink, implying that different parts were added at different times during the copying process, some perhaps after the entire manuscript was completed. 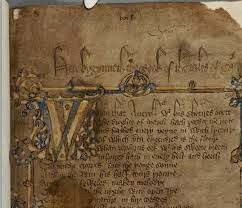 The addition or deletion of the stanza is scribal, however, the stanza itself is indisputably Chaucerian – and so it appears in almost every modern version of the text, including the Riverside, Norton, and Penguin editions. Nevertheless, whether the Host Stanza should interrupt the movement of tales or not, the Merchant’s Tale should closely follow the Clerk’s, as the verbiage used to mirror each other is far too calculated to indicate otherwise. As previously stated, it is a strong belief that Fragments IV and V should be one cohesive fragment, and the indication comes from the rearrangement found between the Hengwrt and Ellesmere manuscripts. In the Hengwrt, the Merchant’s Prologue, the piece that mimicks the ending of the Clerk’s Tale, is absent, with the implication that it had not yet been found. However, once it is procured, it’s inclusion in the Ellesmere indicates the “correct” placement of the Merchant’s Tale quickly following the Clerk’s. Unlike how the Clerk’s tale must follow the Wife at some indiscriminate point, the Merchant must follow the Clerk closely enough for the echo to be heard. Without the prologue, the most that could be gleaned from reading the Merchant’s Tale is not much more than what may be learned from reading the Clerk’s – both must follow the Wife. However, both have more in common than just that. The two stories are so structurally similar (more so than any other two tales in the CT), that placing them together would best highlight the ways in which they identify with one another. Granted one is longer than the other, underneath the superficial differences, they are basically the same story with different character names. To properly depict their similarities purely on structure, a tabular outline would serve best. (I am well aware that my blog does not format well, so I haven’t the slightest clue what this will look like when you see it, but it is supposed to be a two column table-like structure… so let’s pretend). returned less return from the dead. Griselde is returned to her station and all May is forgiven, restored, and all is well. It is almost as if both tales follow a template. However, the Clerk’s Tale, while Chaucerian in writing, is strictly adapted from Book X of the Decameron. So that is the template onto which the Merchant’s Tale is created, modeled after the Clerk’s, and the similarities would not be as prominent if the two would be split from each other. In fact, over a series of tales the similarities would be almost completely lost except to those probing for it. For an author that writes a retraction with such sarcasm and absolute boastfulness, he would surely want to advertise his many abilities, including the tale mirroring tricks witnessed here. Note: the above “table” paralleling the two tales is exceptionally vague on purpose in order to underscore the main points. However, a close reading will also demonstrate how the language used during each interval is carefully chosen within each tale to echo back and forth. The next piece of this argument is a little more involving and I don’t think I will be able to finish it tonight. My discussion of Fragment V is soon to follow.